What's this, another TR7? And one of the Hairdresser variety at that? 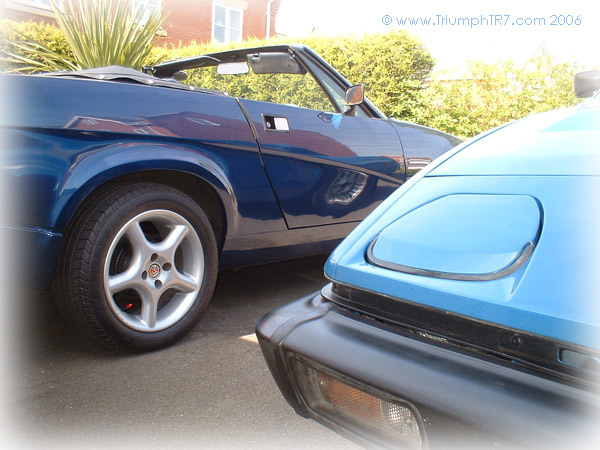 Yep, after 16years with TRisha TR there's another TR7 on the drive. Whereas TRisha is a beautifully crafted, manly, FHC of the Speke era, her new brother - 'TRickett' is one for the barnet trimmers - a DHC from the TR7's time of Solihull production; going by the VIN he's one of the last 1000 made.
. Though the lidless one is a rather more modern Rover Tahiti Pearl. Yep there's some difference between the two vehicles. So we start looking at the differences by giving you what's the same! 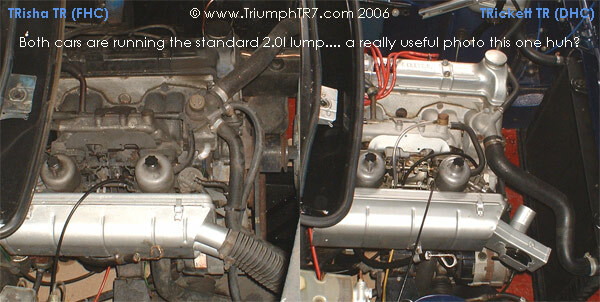 It's worth saying that both cars have the standard 2litre, slant four engine and both have stainless steel exhausts and tubular manifold - surprisingly both retain the original air filter set up, though TRisha has uprated carb needles. the gearbox. Who has driven an auto before? Modern automatic cars tend to be at least 4spd, many are 5spd and if you have a VAG car (such as an Audi A3) you may have the 6spd DSG gearbox, but these advancements are pretty modern - the late 90's still saw new cars were being shipped with 3spd autos (well the Chrysler Neon courtesy car I had in 2002 was only a 3spd). Until recently flappy paddles and sequential shifters were the reserve of high-end, luxury, model cars, or the lair of Jap Coupes - well Mitsubishi ones at any rate. And having driven modern auto's (the VAG DSG and the alluded to Jap Coupe - FTO) I was in for a shock! For a start the accelerator seemed heavy, chiefly so as to effect the kick-down, zipping out onto a busy round-about nearly ended in disaster! The pick up was slow and the weight exerted on the right pedal really wasn't enough. That said the gear changes are smooth and kick-down brings a swift downshift, though at the wrong RPM the screaming engine scares you into submission. When driving under normal conditions the upshift sometimes seems a little slow, the car hanging onto the revs for just a little too long. In town traffic it can require an act of gentle persuasion to coax the car up into 3rd gear. In all though I was pleasantly surprised with the smooth changes and a generally relaxing drive, even though high-end cruising is difficult with the engine revving at around 4200RPM at 70mph. Comparing this to the 5spd is a world of difference; firstly sitting in traffic the heavy clutch can cause my dodgy left knee some jip. 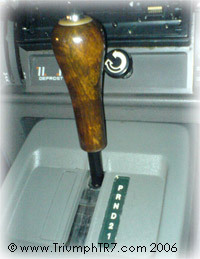 Unlike the manual transmission the automatic gearbox doesn't need to 'warm' up - it's smooth straight 'out of the bag' while the notchy, manual, gear changes become smoother only after a couple of miles. But that's nit-picking, I like the LT77 gearbox - it certainly helped when it came to driving a TVR Griffith, the notchy gearbox of Blackpool's finest was a breeze. 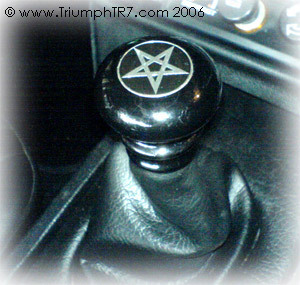 I'm willing to accept that as "user error" though rather than a problem with the shifter, similar to how I've heard people gripe over the Reverse, First & Third on the LT77 all being a little to close. The second segment? Carry on reading! What's your take on the FHC vs DHC debate? Let me know what you think... but remember it's my site so I may ignore your views, especially if you drive the DHC!! !